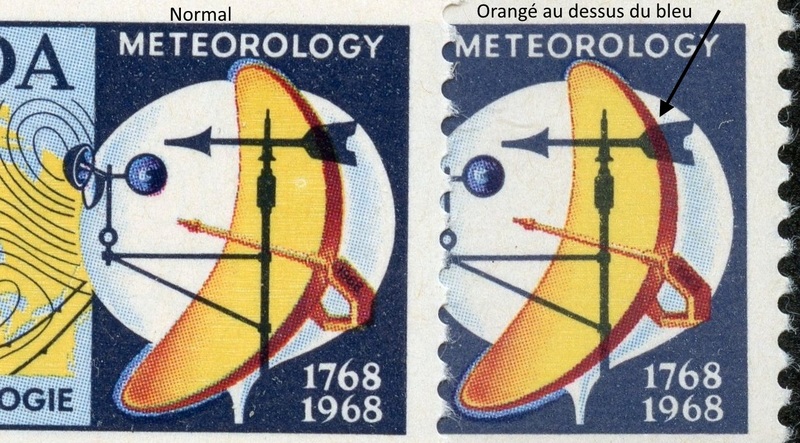 The value of a Meteorology, 1768-1968 - 5 cents 1968 stamp depends on several factors such as quality and wear, supply and demand, rarity, finish and more. Values in the section are based on the market, trends, auctions and recognized books, publications and catalogs. This section also includes information on errors and varieties and characteristics. This Meteorological stamp commemorates the 200th Anniversary of the year in which Canada's first long-term fixed point weather observations by established scientists were undertaken. Started at Prince of wales Fort, Churchill, by William Weiss and Joseph Dymond on 10th of September 1768, the daily observations by thermometer and barometer continued until August 27, 1769. Earlier remarks on weather had been recorded by soldiers, explorers and others but these are largely non-instrumental and were made in transit rather than at a fixed point. Dymond and Wales were at Hudson Bay under instructions from the Royal Society to observe the transit of Venus. Wales, one of the formost astronomers and mathematicians of his day, was later to accompany Capt. Cook on voyages around the world. An unfamiliarity with the environment and harsh weather conditions is evident in writtings of the observes published in 1771. Their phraseology, too, is in striking contrast to today's familiar weather terminology; at one point they wrote ; the liquid in which the plumbline of the quadrant is immerged, consisting of water, and about one fourth part brandy, is this morning froze so hard, that I can scarcely make an impression on it with my finger. The trading post Fort Prince of Wales, originally established as Fort Churchill, was destroyed by fire while under construction in 1689. It was rebuilt in 1717. Remants of the forts are preserved by the Canadian Government as a national historic site. 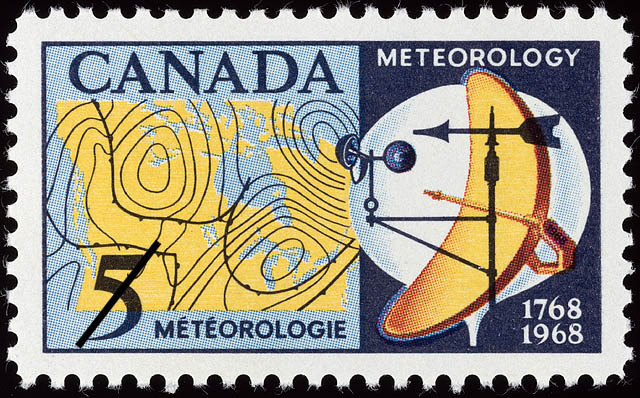 The design of the Meteorological Readings postage stamp incorporates an authenticated section of a recent surface weather map prepared by the Meteorological Branch of the Canadian Department of Transport. The right panel is a composite of an anemometer, used to establish wind speeds and direction; a radar antenna for weather surveillance, and a weather balloon which carries aloft a radiosonde to measure pressure, temperature and humidity of the upper air. Though providing a vital national service, Canadian Metorologists also contribute to a co-operative programme in which weather balloons furnish world-wide readings. The Meteorologist is primarily interested in the atmosphere up to 100,000 feet above surface. This is a comparatively shallow layer of air and if the earth were reduced to the size of an apple this layer would be represented by the skin. The weather may be said to have a stronger and more continuous impact on our lives than any other feature of the environment in which we live. There are Biblical references to the atmosphere and Aristotle dealt with the weather in his writings. Meteorology, however, is a science which had its beginning in the 17th century. Galileo's invention of an elementary form of air thermometer in 1607 and Torricelli's air pressure experiments leading to Pascal's barometer in 1643 were significant events triggering the beginning of an objective scientific study of the atmosphere. In Canada today, apart from general weather forecasts, Meteorologists provide services vital to aviation, industry, public utilities, shipping, agriculture, and forest interests. Weather shots taken from satellites add a new dimension of interest for the average person who, in the comfort of his home, may now view television transmissions of photographs clearly showing weather patterns covering many thousands of square miles. Untold loss of life and property is averted by special bulletins ranging from frost warmings for agriculturalists to hurricane alerts. Official weather recordings in Canada began in Toronto in 1840 and the National Meteorological Service was established in 1871.